Cops N’ Bandits was released in 2012 by Playtech. The game has set of 5 reels and 30 Paylines. The graphics of the game are clear and simple based on the theme Police and Bandit chase. The symbol of the game are theme oriented and includes Money Bag, Hand Cuffs, Police Badge, Policeman, Green Thief, Red Thief, Wild Symbol and other high value card symbols ranging from Ace to number 10. In the background game doesn’t have any background music during game play but does feature the usual gameplay sounds. The highlight of the game is the Line Up Bonus Feature. The game has set of 5 reels and permanently enabled 30 paylines. The coin size varies in the denominations of of 0.01 up to 25.00 per pay line,. The minimum bet amount is 0.01 and the maximum bet amount is 750.00 per spin. The highest jackpot of the game is 4000 coins. The ‘Wall with Wild’ written over it acts as the wild symbol of the game. The wild symbol can substitute all other symbols for winning combination except the scatter symbol. The combination of multiple wild symbols on a payline creates its own winning combination. The Police Badge symbol and Blank Bandit Face symbol in the game acts as the scatter symbol. This means that Scatter symbols can be scattered anywhere on the five reels to activate bonus feature provided three or more appear on the reels. Blank Bandit face Symbols appear only on reel 1, 3 and 5. This Bonus game is activated when 3 or more of Police badge scatter symbols appear on screen. 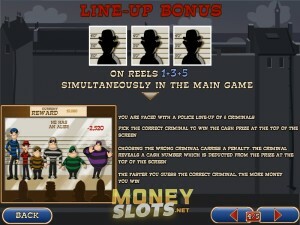 If 3 Police Badge appear on screen, Player has to choose 1 among the three to reveal the number of free spins awarded. If 4 or 5 symbols appear player chooses 2 symbols to reveal the number of free spins. This feature can’t be re triggered. This feature is activated only during free Spins. If a Cop appears on immediate left or right of Theif, The thief symbols turn to extra wild and substitute for all other symbols starting from next spin. This feature is not triggered during the last free spin round. All extra Wild Symbols remain on place until the free spins end. This game is triggered if 3 blank face Bandit Symbols appear simultaneously on reel 1, 3 and 5. In the game player has to choose the criminal among the lineup of 6 bandits. If the player chooses the right criminal a Bonus amount is awarded and the faster the player guesses the more amount is won. This Slot Machine game is based on the theme of Police and Bandit Chase, The graphics and reels symbols all are design on the same theme. This game features the story of two Bandits named Skinny Larry and Tiny George who rob a bank and are chased by a Policeman named Slim McThin; and in the end get caught and are placed behind the bars.